In response to a Freedom of Information (FoI) request from Drone Wars, the Ministry of Defence (MoD) has again refused to detail the number of armed British Reaper drones undertaking operations in Iraq and Syria, the location of their base in the Middle East or whether they have been involved in missions over Libya. 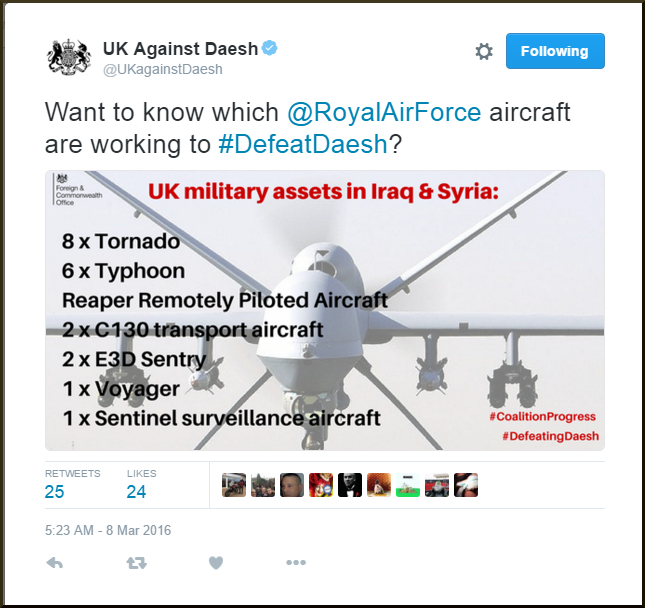 The UK is known to have ten armed Reaper drones in service. 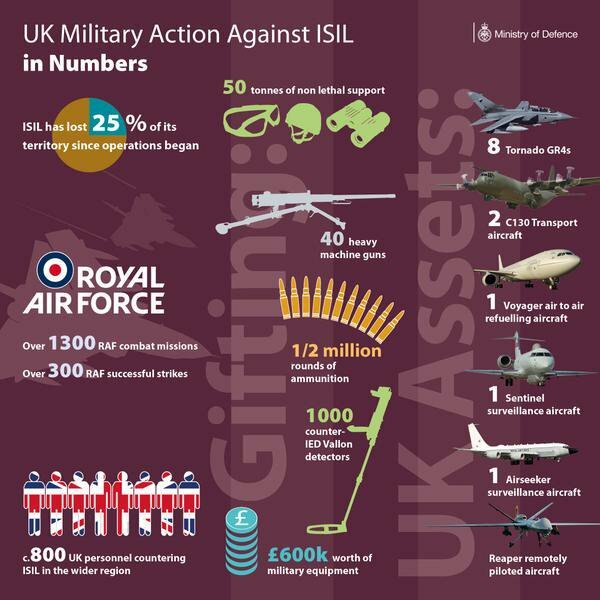 The MoD insists that both the number of British Reaper drones involved in operations against ISIS and the location of their base must remain secret “for reasons of safeguarding operational security.” In stark contrast the MoD quite readily gives details of other RAF aircraft undertaking operations in Iraq and Syria as well as their operating base without it causing any problem with operational security (see MoD leaflet here and FCO graphic left as example). It appears that the RAF’s armed drones are being treated differently from other military aircraft as the MoD wants the option to use them covertly. Refusing to publish details of where the UK’s armed drones are at any given time gives the UK the ability to deploy them on operations without the public, the press and of course, the people they are being used against, being aware of such operations. Importantly, as the graphics illustrate, this policy applies only to the UK’s armed drones and not its other military aircraft. This policy came into existence in 2014 when the UK committed to the use of armed drones beyond operations in Afghanistan. Throughout their use in Afghanistan the MoD detailed on numerous occasions the number of British Reaper drones on operation and that they were based at Kandahar Airfield. However when the MoD decided it wanted to retain its armed drones for use in an expeditionary role beyond Afghanistan, the MoD brought in greater secrecy. 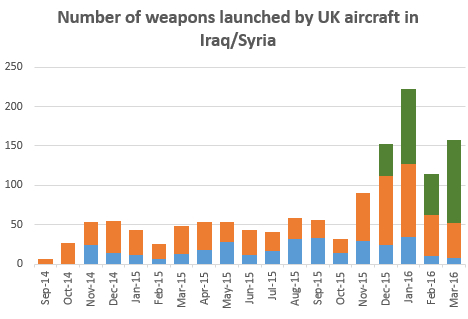 There are of course a large number of “air assets” operating over Iraq and Syria so this hardly seems the most credible of answers. The MoD goes on to say that they ceased to release such information when the UK began to withdraw from Afghanistan as it could have “disclosed potential capability gaps” and that this policy has continued into Operation Shader (Iraq and Syria). Some will no-doubt argue that the UK should be able to deploy and use armed Reaper drones without making details of such operations public. However all but the most zealous of interventionists will recognise the need for proper public oversight and accountability for such military operations. The deployment of armed drones in particularly needs to be carefully monitored as they have become the preferred means of undertaking extra-judicial targeted killings. 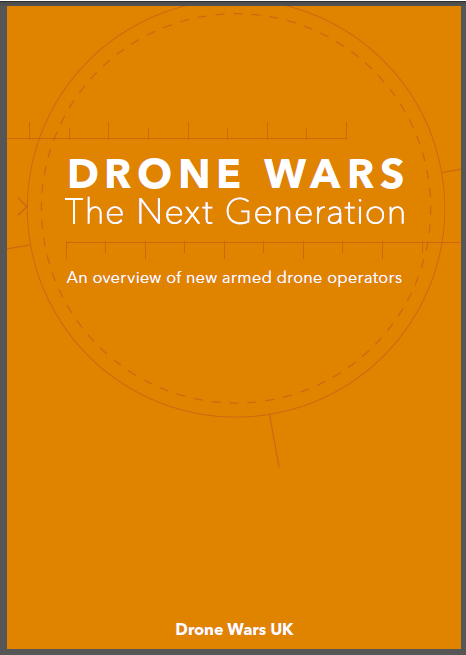 Indeed it can be argued that this technology has hugely expanded the use of targeted killing particularly by the US over the past decade, but also by the UK and Israel. This reason alone should make the public oversight of the use of armed drones critically important. In addition it has long been argued that there should be parliamentary approval for UK military action overseas. In 2011 the Government finally acknowledged that a convention had emerged that he House of Commons should have the opportunity to debate the deployment of military forces except in the event of an emergency. However it remains unclear what type of military action would trigger such a debate. Eighteen months later in January 2016 amid discussion of UK military intervention in Libya, Vice Chair of the All Party Parliamentary Group on Drones, David Anderson MP, again asked the MoD if they would ensure that parliament had an opportunity to debate the deployment of UK Reaper outside of Syria and Iraq. Michael Fallon gave a dismissive, one word answer: “No”. At the same time, (January 2016) the MoD told David Anderson that no British Reapers had been deployed to Libya. A month later, asked again about Reaper operations over Libya following revelations at a Foreign Affairs Select Committee hearing that British military aircraft were already undertaking missions over Libya, the MoD resorted to a ‘no comment’ response. In its latest FoI response, the MoD has again refused to detail which UK aircraft are flying missions over Libya. Until recently only three countries are known to have used armed drones outside of their own territory – the US, Israel and the UK. Last month came evidence that a fourth nation, Iran, has now joined the club. With the US now agreeing to arm Italy’s Reaper drones and Pakistan, Iraq and Nigeria now operating Chinese armed drones many more countries are likely to begin to use armed drones across borders. The UK should recognise that it has both the responsibility and also the opportunity to set high standards internationally for transparency and public oversight of the use of these systems. However if the UK argues that such basic details as the number of armed drones on operation cannot be released, other nations, particularly European nations who are acquiring such systems, are likely to follow this lead. 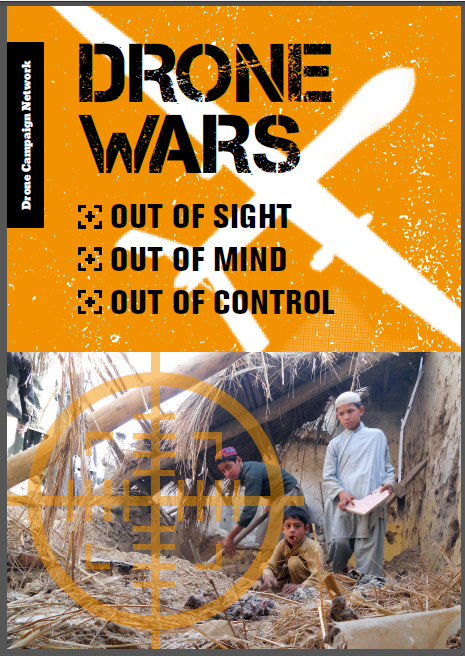 We believe that at the very least, basic details about the number of armed drones on operation overseas – details which the UK is happy to provide for its other aircraft – should be released in order to contribute to proper public accountability and oversight of these systems, as well as a way of encouraging other nations towards greater transparency. We shall be challenging this FoI refusal. You may challenge but you will fail. The reason is, as you acknowledge, ‘covert ops’ and there is good reason (opsec) for this. Drones are much more likely to be widely used in support of SF or Intel Ops whose deployment is under ‘Executive Authority’ and merits the convention of ‘no comment’. The deployment of other ac (eg RivetJoint, Shadow, Chinook or C130) in support of SF activity is similarly treated. There is no ‘precedent’ here, let alone one that is dangerous. If SF on the ground require drone ‘overwatch’ they will get it without debate in Parliament – and quite rightly.